The small town of Pemuteran is located in the North-West of Bali near Java. This is where our dive center Abyss Ocean World is based and operates the most. Pemuteran Bay offers many dive sites for the great pleasure of scuba divers. Note that this list is not a rank from the best to our least favorite dive sites. For those of you who has limited time to explore the area, here is our top four most interesting dive sites to be discovered. Divers who like Macro diving may wish to dive other sites such as Bianca’s Garden and Bio Wreck more than some sites on this list. This underwater hill has the best coral of the bay in terms of health, density and diversity. Napoleon reef is named after the great number of Napoleon fish observed here few years back, unfortunately not so many remains today. The very top is at a depth of 4 meters and goes in every direction down to 30m on a gentle slope before reaching white sand. The shallow part is mostly covered with hard coral which is slowly replaced by soft coral as you go deeper. Different kind of sponges, gorgonian seafans possibly hosting pigmy seahorses and a lots of different colorful nudibranches, scorpion fish, moray eels. School of blue fin trevallies are often spotted on the top part of the hill. Amateurs of aquarium ambiance and macro life… this dive site will please you! 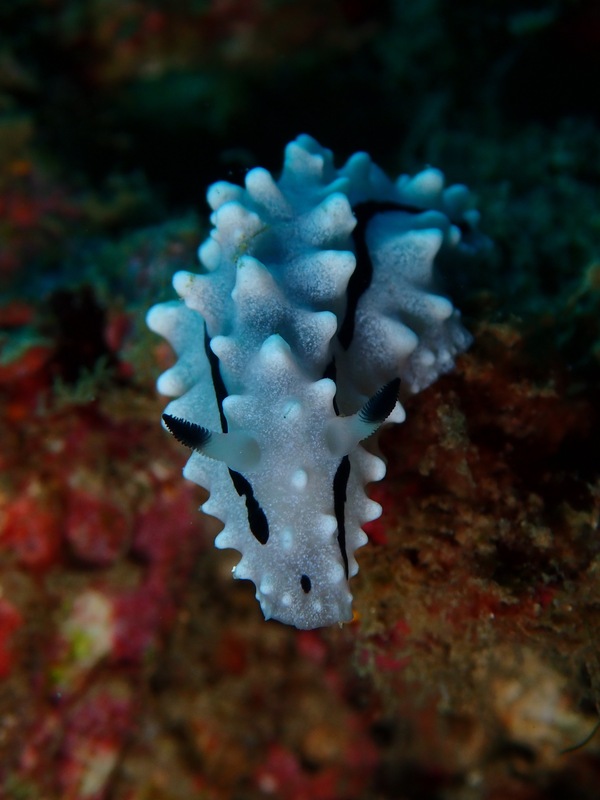 Nudibranch are some of the most common marine life in Pemuteran. We can also spot white tip sharks, jacks, batfish and octopus in the area. 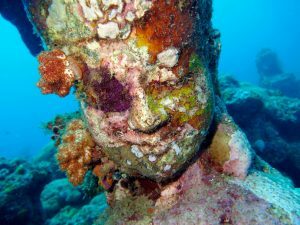 Have you ever dream of doing some archeology scuba diving? Build in 2004, this underwater temple gives you that feelings. Located at the western boundary of Pemuteran bay, there are 2 man-made sections incorporated to the reef. You start the dive following a mooring from the surface to a sandy bottom. At 28 meters you will find a Balinese temple with its entry door, walls and statues. Behind the temple is a wall, which leads to the second stage consisting of gods statues on a plateau at 15m. You can find a lot of macro life like nudibranches, flatworms and many kinds of shrimps on those statues and the surrounding reef. After the years, some part of the temple collapsed and the marine life took over making you feel like some sort of scuba diving Indiana Jones discovering a lost archeological site. This seamount is called “deep” because its shallower part is found at around 12m. This site is quite small and goes down deeper and on steeper slopes that Napoleon or Close Encounter. This place is a paradise for macro life and some very specific species are found here such as yellow tip phyllodesmium and halgerda batangas. 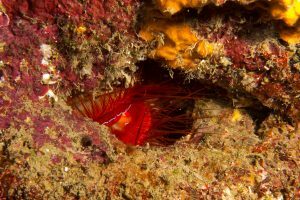 Down the South side of the dive sites, you can find a small wall at 20 to 25m where electric fire clam inhabit. Among others, you can observe many varieties of shrimps (squat lobster, mushroom coral, boxer, saraswati… and even the magnificent mantis), cuttle fish, octopus, devil stinger and other scorpion fish. The top part of Deep Reef doesn’t have much coral but young hard and soft corals covers the slopes. You will also find a lot of sea fan and barrel sponges where you can look for pink squat lobster. Our guides know where to look for electric clam, phyllodesmium nudibranch as well as octopus at this site. Located on the eastern side of the Bay, the Jetty is the “muck dive” site of Pemuteran. Don’t expect to find coral in this place but only sand and debris where very particular marine species lives. If you are not familiar with this type of dive check our blog to learn more about it here. The dive starts near a wooden jetty on shallow water and follows the shore going inside the bay. There are several concrete blocks with mooring lines along the site and all kind of debris (natural or not) that became houses for fantastic marine species. Here’s what we can find on this site: long nose pipefish, ringed pipefish, robust and ornate ghost pipefish, frogfishes (giant and painted), upside down jellyfish, Pegasus, common sea horse, flying gurnard and different kinds of shrimps and nudibranch (among many others…). Even if this site may contains a lot of debris, please dive with environmentally friendly dive center and organisation such as the one certified by Project Aware or Green Fins. If you have never tried muck dive before, the Jetty of Pemuteran is the best place to start. Our professional diving team at knows very well these sites as we dive here every day. Contacts us now if you want to discover the best of their beauty and secrets.